Asia-Pacific is the fifth most prosperous of the world’s seven regions. Prosperity in the region has grown faster than any other in 2016-17, and is now close to the world average. 12 countries rose, and 12 fell. The Asia-Pacific top ten has not changed since last year. The pillar that has improved the most across the region since 2007 is Business Environment, particularly in East Asian countries such as China and Indonesia. Governance across the region has also seen positive change. A notable example is legislation in India that increased the ability to challenge regulation in the legal system. Asia-Pacific is the weakest performer of any region on the Natural Environment pillar, mainly due to air pollution and access to clean drinking water. Asia-Pacific countries occupy the bottom eight places of the Index for air quality, with China at the very bottom. Kazakhstan has improved its prosperity ranking by 11 places, led by improvements in Social Capital, Governance and Health. For example, there were a higher number of vaccinations against diphtheria, and more people were satisfied with the quality of healthcare. India closed in on China, improving four ranks through gains in Business Environment, Economic Quality and Governance. In Economic Quality, this is due to the proportion of the population with bank accounts, which increased from 35% in 2011 to 53% in 2014. Thailand saw the largest fall in availability of shelter. The number of people saying there had been times when they did not have enough money to provide adequate shelter for themselves or their family rose from 11% to 35% since last year. Indonesia and India saw the largest falls in reported availability of adequate food since last year. In India, the number of people saying there had been times when they did not have enough to eat rose from 26% to 35%. In Indonesia it rose from 32% to 41%. Economic growth in Asia-Pacific has lifted millions out of poverty and many Asia-Pacific countries have achieved, or are on their way to achieving, significant material wealth for their citizens. After North America and Western Europe, Asia-Pacific has the best Economic Quality and Business Environment. Countries such as South Korea, Singapore and Japan have demonstrated how a country can move from poverty to prosperity within a generation. Since 2007, real GDP per capita in Asia-Pacific has risen by 36%. 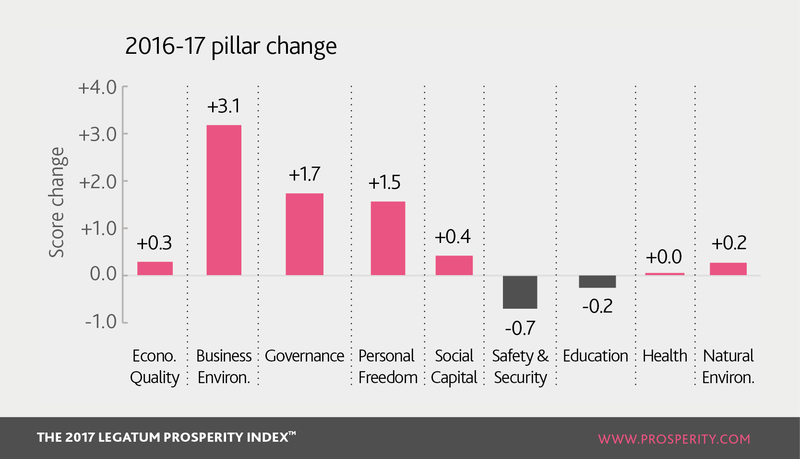 But prosperity is more than just economic success. An important feature of prosperity is Personal Freedom. Personal Freedom matters because it contributes to material prosperity and, more importantly, because it allows individuals to make choices about their own happiness and wellbeing that are unconstrained by external forces. 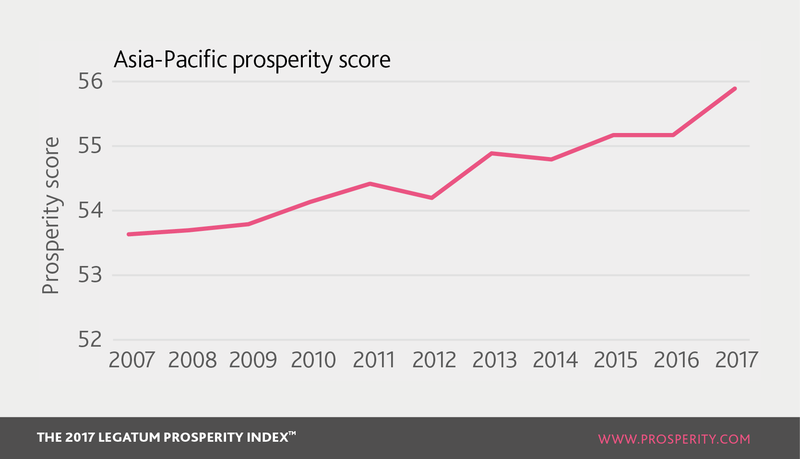 It is here that Asia-Pacific performs particularly poorly, albeit with some notable exceptions, such as New Zealand and Australia. The region sits second from bottom in the world for Personal Freedom, above only the Middle East and North Africa; and it is weak across all aspects of the pillar. For example, 17 out of 24 countries in the region still have the death penalty; it is sixth out of seven regions for press freedom and sixth out of seven for tolerance of immigrants. There are two possible reasons for this poor performance. First, cultural and social attitudes contribute to restricting the broader aspects of Personal Freedom. For example, Sri Lanka, which is ranked 53rd for prosperity overall, but 107th for Personal Freedom, has one of the lowest social tolerance scores in the world, ranking 131st. This is partly to do with societal restrictions on religion, which the country’s Prime Minister has acknowledged needs to be addressed, given recent attacks on Muslims. This hostility has led to violence: in 2014, for example, anti-Muslim riots in Beruwala and Aluthgama resulted in four people being killed and 80 injured. It remains to be seen whether the Prime Minister’s intent becomes action that improves religious freedom. Religious hostilities can lead governments to restrict individual freedoms and basic legal rights. 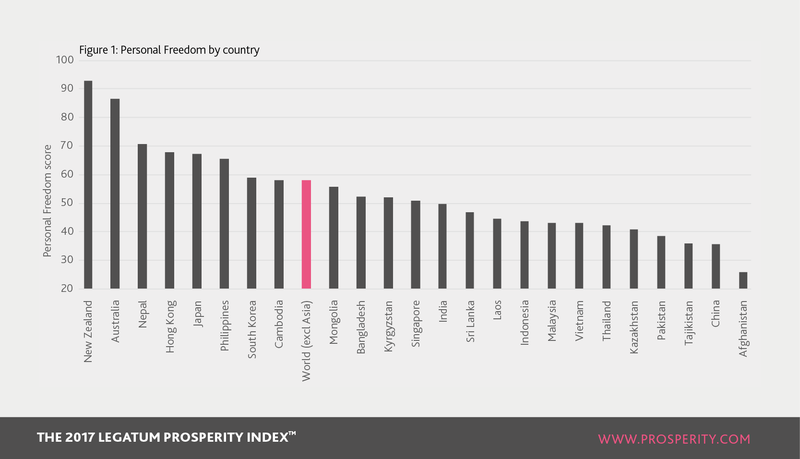 Malaysia, which is ranked 20th for Business Environment, but 120th for Personal Freedom, saw a decline in overall prosperity because of increased societal restrictions on religion, where it now ranks 132nd. On government religious restrictions it ranks 140th. While the Constitution protects freedom of religion, there have been increasing examples of hostilities to minority faiths. For example, there have been cases of restrictions on the use of the word “Allah” for non-Muslims and of some faiths being declared illegal. Secondly, in some of these lower-ranked Asian countries, it appears that the desire to pursue economic growth and political stability has often been the motive and reason for sacrificing individual personal freedoms. For example, Singapore, which has had a dramatic rise in economic success since its foundation just 50 years ago, is now the most prosperous country in the region after New Zealand and Australia, but ranks 95th in the world for Personal Freedom. This low ranking comes in part from a lack of press freedom, where it sits at 112th in the world. Despite the constitution providing for freedom of speech, there have been multiple cases of the government, or its members, using court action to silence negative media coverage. The Government also restricts the practising of some religions – it ranks 133rd in the world for restrictions on religion – and retains the death penalty, with the most recent execution taking place in July 2017 for importing heroin. The reason for some of these restrictions is a desire to maintain social order, which is perceived by some to support Singaporean prosperity. In the long run Personal Freedom is an essential part of prosperity. This is particularly true as countries become richer and people have the resources to realise freedom of choice. Personal Freedom also fosters diversity, which can foster innovation. Countries in Asia-Pacific need only look at New Zealand and Australia to see that Personal Freedom is compatible with material wealth. There are promising signs: since a low point in 2012, Personal Freedom in the region has been improving, particularly in individual freedoms and social tolerance, although basic legal rights have weakened slightly. Nevertheless, it is clear that more can be done to provide freedom to citizens of the Asia-Pacific region.